Can’t decide between planes and helicopters? Why not do both - this tour combines the best of both worlds! See Uluru (Ayers Rock), Kata Tjuta (The Olgas) and Lake Amadeus from a fixed-wing aircraft before landing at Kings Creek Station. 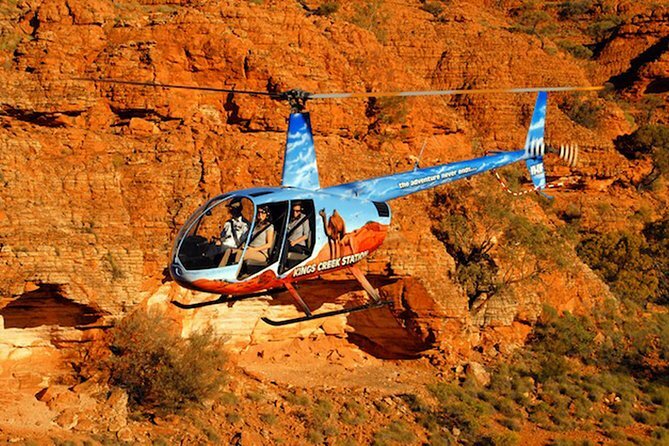 Board a helicopter for a 30-minute flight over Kings Canyon and the spectacular George Gill ranges. A stop at Kings Creek Station following the flight gives you a chance to refresh before your return. Enjoy guaranteed window seats on all flights. Departing from Ayers Rock Airport, your scenic flight takes you along the northern and western faces of Uluru and Kata Tjuta. Flying over the remains of an ancient coral reef on the way to Lake Amadeus, your pilot will descend down to conduct a low level pass following the inlet into the lake. Once overhead, orbit at low level to view the incredible patterns on the surface of the lake and the beautiful colors that make this one of the most breathtaking views in the area. Climb up and take in the whole 112-miles (180-kilometres) of the lake and its patterns. Enjoy the flight across the Australian outback and gain an appreciation of its vastness on the way to Kings Creek Station, which is a working camel station in outback Australia. Here you will be able to visit the station house and get up close with some of their friendly camels, there is also time to purchase lunch or snacks from the station house. You will be transferred to a helicopter to begin your scenic flight over Kings Canyon. From the station helipad, track over the George Gills Range toward the Wannamarra community located near Baggots Gorge with beautiful River Red Gums leading out from the spring. Pass through Petermann Pound; a large naturally formed crater and home to many wild horses, camels and cattle. Try to spot them wandering along Petermann creek, a dry creek bed which flows all the way across Petermann Pound. Continue west over Petermann saddle, a natural rock bridge formation which is the boundary for the Watarrka National Park. Track the north cliff of the George Gill Range toward Carmichael Crag and witness the beauty of dry valley and dry creek. As you reach Kings Canyon, turn over Back Canyon on the northern face of the range while your pilot points out the Lost City along the edge of Kings Canyon and the Garden of Eden waterhole located inside the canyon walls. Once you return to Kings Creek Station, you will return to the fixed-wing aircraft to commence your journey back to Ayers Rock Airport. En-route, pass over the eastern end of Lake Amadeus which houses some of its most vibrant colors. Your local pilot knows all about the red center and its surroundings and will provide you with expert commentary, so please feel free to ask as many questions as you like. Experience a view like no other!